image via In The Cut. The distinctive Manhattan Avenue landmark has told time since the 19th century, but it did not always stand at 733 Manhattan Ave. where it does today. Previously, the clock told time in front of Bommelstein’s Jewelers at 753 Manhattan Ave. The clock was made by the E. Howard Clock Company of Boston, and was a type of street-level commercial, advertising the jewelry store. Bommelstein’s went out of business and the clock fell into disrepair. There was even talk of dismantling the timepiece in the late 1970s. Dr. Sebastian Polizzi stepped up and saved the clock. The Landmarks Conservancy was looking for someone who would maintain the clock and Polizzi volunteered. 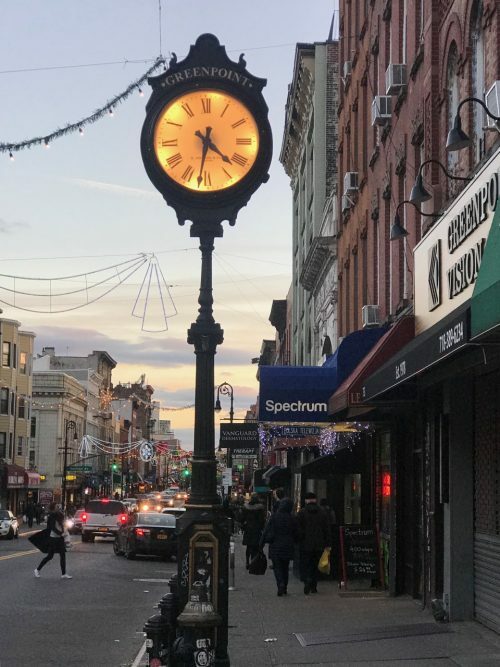 In 1981, the city designated the clock a landmark at its old location, but the clock was moved in 2001 down the street from 753 to its present location in front of Greenpoint Vision Care at 733 Manhattan Ave. In 2002 the clock was nearly destroyed when a truck slammed into it, but the family had the head of the clock repaired and the timepiece survived. In the meantime, Dr. Polizzi passed away and his daughter Dr. Christina Polizzi inherited the business and stewardship of the clock. 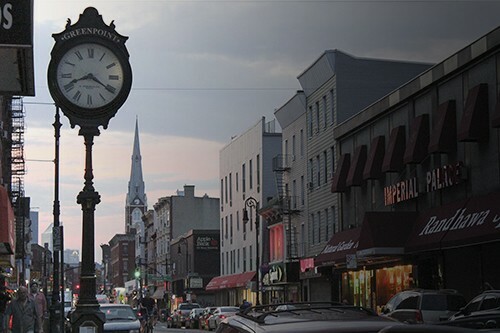 In 2017, the Brooklyn Historical Society asked her to fund a renovation of the clock, which had stopped keeping time. Spending $8,000 of her own money, Dr. Polizzi had the landmark repaired by the Howard Company, and for the first time in years on Nov. 28th of last year, the clock again displayed the correct time. Greenpoint is blessed to have concerned merchants like the Polizzi family who take such an active role in preserving our local history. 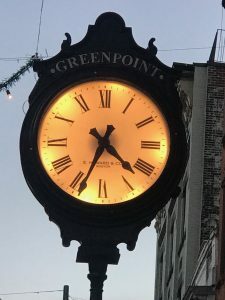 The now-ticking clock is a tribute to Dr. Polizzi and his family who have made sure that future generations of Greenpointers will be able to enjoy this piece of living local history. I am the current owner of the storefront at 753 Manhattan Ave, Dashing Diva Nail Salon. I know of the history of the clock, and was wondering if there was anything we can do to help out with the historic preservation! I think it is very sad that much of the Government of NYC and all the unleashed developers are slowly whittling away at our beautiful city to make a buck. Why isn’t LPC demanding that for every ugly building in the vicinity of a listed landmark or notable piece of history be preserved at their cost. They won’t own it but it would be a small price to pay to keep history alive in a slowly eroding town.